Hi I am Shyamala. I am fascinated by the immense canvas of textile art in India - weaving, dyeing, printing, embroidery, and much more - but it is block printing that fully engages my creativity. Professionally trained in Sociology, I found my calling in textile arts, beginning with embroidery, tailoring, dyeing (tie and dye, resist dyes, etc. 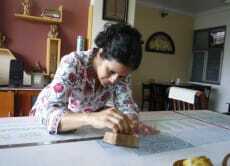 ), then in exhibitions and fairs for textile arts, and now in block printing - both custom clothing and workshops. My interests in sociology and textile arts have made for interesting experiences when travelling to and living with artisan families in different parts of India. I look forward to showing and teaching you more about this beautiful art.